"Mama's Gun" is overproduced rock ALA Lenny Krawitz, making this album sound more like Jimmy Nail's rendition of 'Love don't live here any more' than previous Badu material. Harsh I know, but it hurts to hear Erykah's amazing talent stifled by the studio. OK, so there are a few good tracks, but nothing to compare with the live stuff Erika released after her last studio album. 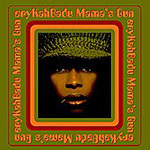 Listen to Badu's work with Roots, with Lucy Pearl, listen to Tyrone before you listen to "Mama's Gun" and you will understand.